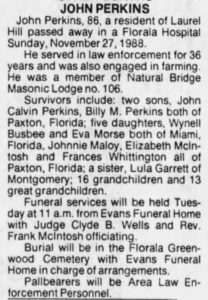 John Perkins, 86, a resident of Laurel Hill passed away in a Florala Hospital Sunday, November 27, 1988. He served in law enforcement for 36 years and was also engaged in farming. He was a member of Natural Bridge Masonic Lodge no. 106. 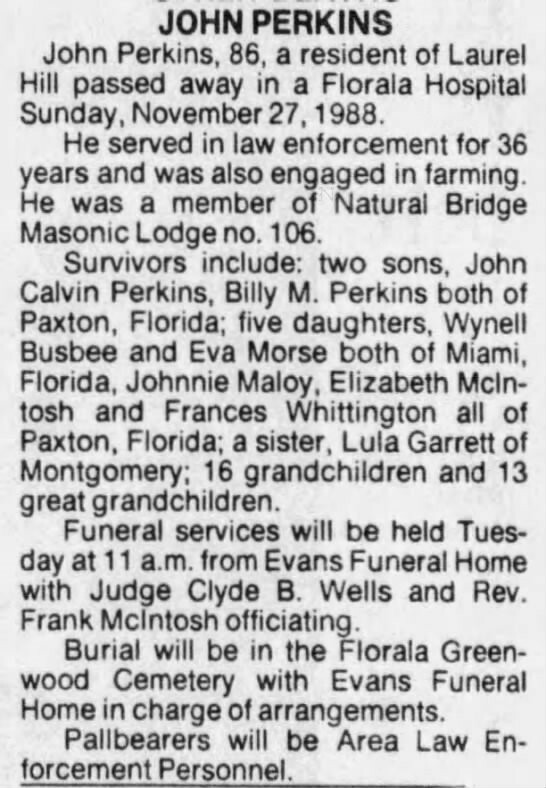 Survivors include: two sons, John Calvin Perkins, Billy M. Perkins both of Paxton, Florida; five daughters, Wynell Busbee and Eva Morse both of Miami, Florida, Johnnie Maloy, Elizabeth Mcintosh and Frances Whittington all of Paxton, Florida; a sister, Lula Garrett of Montgomery; 16 grandchildren and 13 great grandchildren. Funeral services will be held Tuesday at 11 a.m. from Evans Funeral Home with Judge Clyde B. Wells and Rev. Frank Mcintosh officiating. Burial will be in the Florala Greenwood Cemetery with Evans Funeral Home in charge of arrangements. Pallbearers will be Area Law Enforcement Personnel.